This map is informational only. No representation is made or warranty given as to its content. Buckeye Cup and TourneyCentral.com assume no responsibility for any loss or delay resulting from such use. Many sports parks DO NOT have a street address. If there is no street address for a park or it is not known, it will not appear below. Teams are encouraged to double check with reliable third-party maps and/or DOT sites for construction, detours and delays. 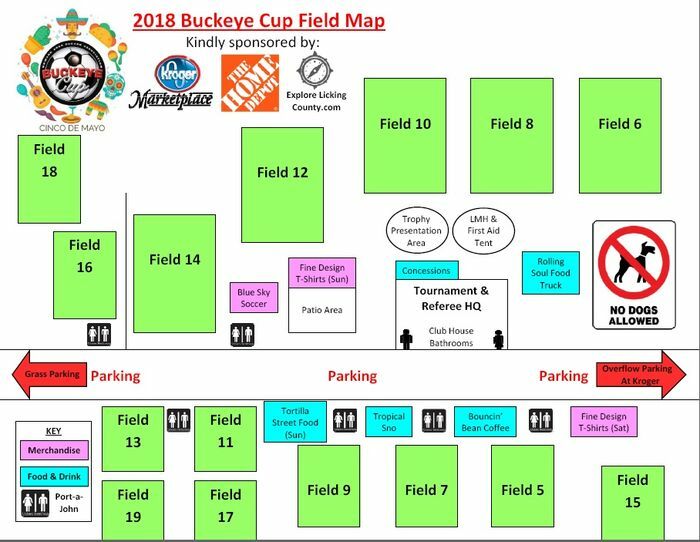 Buckeye Cup assumes no responsibility for the accuracy of third-party maps or web sites. East of Columbus, Ohio via Route 70; 37 North to 16 East to North 21st Street exit. Turn north on 21st Street 1.2 miles to Baker Blvd. Turn left at Baker Blvd. Drive back to soccer fields at Alford-Reese Park. NO DOGS ALLOWED ON THE PROPERTY!!!! Team tents can be set-up on the North or South perimeter of the complex. No tents may interfere with the tournament in any manner and must be removed.